Bendigo Art Gallery, under Curatorial Manager Tansy Curtain, has done it again. 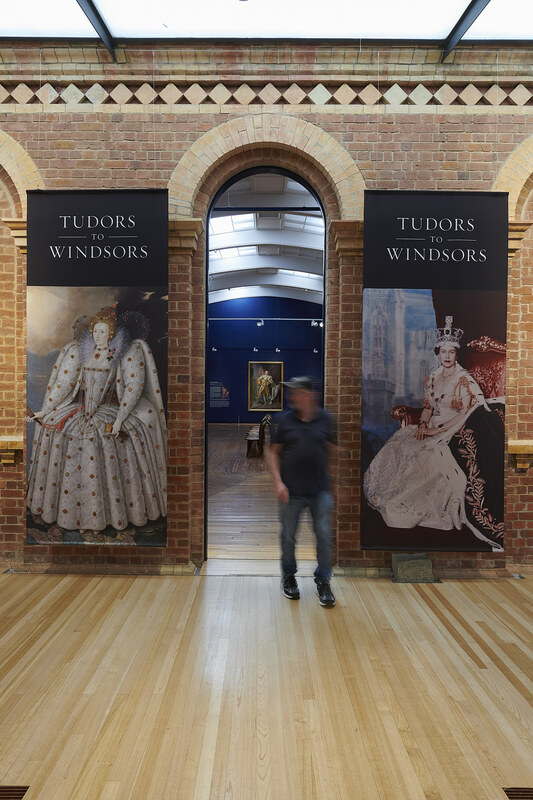 Famed for staging some of Australia’s best exhibitions (from Marilyn Monroe, to Grace Kelly, to Frida Kahlo to Edith Head), their latest showcase, Tudors To Windsors: British Royal Portraits, serves up what any British royalty buff could hope to see this far out in the Commonwealth. As someone with a girlhood obsession with the Tudors, this show had me breathless at the entry, where the image of two Queen Elizabeths greeted me as I embarked on this once-in-a-lifetime foray, one from the 1550s, the other from the 1950s. I felt I should curtsey. You will wander amongst these very public lives, seeking a glimpse into both nation making and private selves. 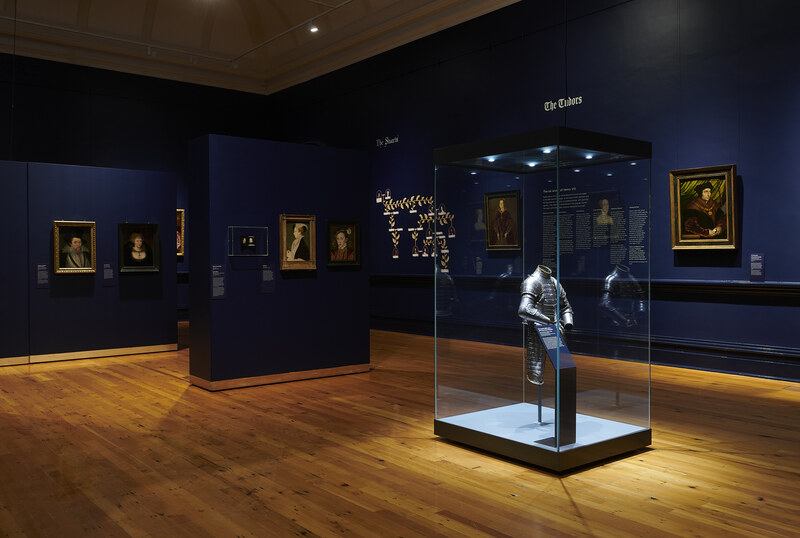 Three years in the making, this exhibition shows the wares of the National Portrait Gallery, London, tracing the history of the monarchy through their famous dynasties. 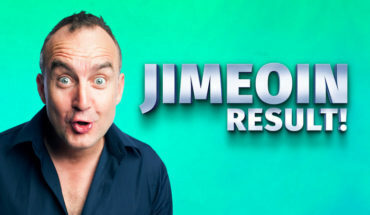 Highlighting major moments of British and world history with factual notes, timelines, and family trees, you will gain a real sense of how these leaders reigned over changing times, culminating in the high Capitalism of the pluralistic global economy we know today at the start of the 21st century. Flowing in chronological sequence, starting with the Renaissance Tudors, through the cataclysmic Reformation, down the civil unrest of the Stuart seventeenth century, to the Germanic influence of the Georgian era, to today’s hipster squad, the Windsors, there are 9 rooms of stately majesty to leave you gobsmacked. Individuals coloured courts and times. This show allows you to meet these significant people, see from whom they descended, and draw you own conclusions about personality and influence. There are some stunning outfits to ogle along the journey. Superbly laid out with ample room to move, you will easily get up close and personal with some of the most famous British names as you move seamlessly from era to era. The show itself mimics royalty’s love for pageanty with its rich resource presentation and has a regal flow from room to room. All that is unique to royalty is here on show. Wealth, inheritance, lineage, executions, treasons, abdications, inter-marriage, insanity, favoritism, beauty, pageantry, and folly. Running across events such as early circumnavigation of the globe, the storming of the Bastille, the American War of Independence, the end of slavery, the turmoil of religious rule and dissent, the execution of Kings and Queens, from early written literacy to the digital age, you also witness a swathe of history. I lost three hours in rapt awe. Combining a mix of portraits, artefacts, fabric samples, photography, film, advertising and other paraphenalia, this show has the theme sewn up box -and-dice. 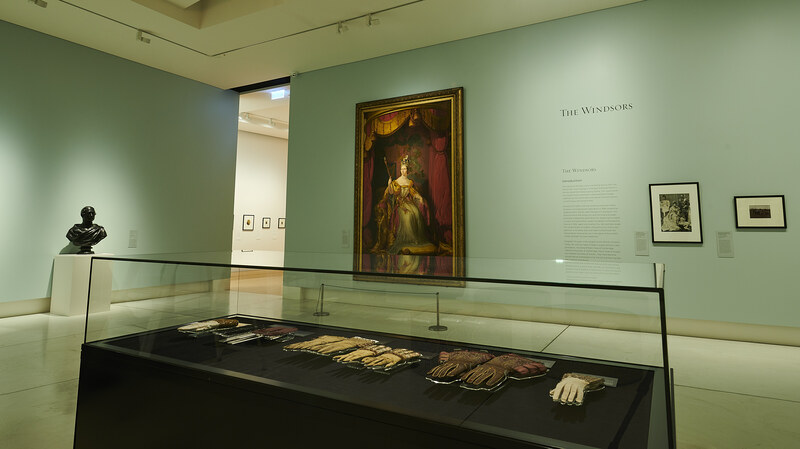 The Afterlives room documents pop culture memorialization, including Mattell dolls, Royal Doulton ceramics, cinema and playbill promotions, advertisements. Another anteroom shows reel footage of coronations and weddings – take a seat and step back in to the event. This is the ultimate appointment with some of the most significant figures to influence English culture. The famous and infamous are all gathered and you will rarely get an opportunity to see them depicted together. Henry VIII and his six wives, Elizabeth’s paramour Robert Devereux, William Cecil, Sir Francis Drake, Walter Raleigh, Thomas Cromwell, Lady Jane Grey, James I, Mary Queen Of Scots, the Kings George, the Edwards, Victoria, to name but a few. You will find your fave monarch, fave period, fave article, fave historical moment. With non-flash photography permitted, it was my one chance to get a selfie with Elizabeth I, and her powerful father, Henry VIII, and the famous Ditchley portrait is resident, with her strings of tear drop pearls, puff sleeves, and divine lace collar and cuffs. There are replicas of the Tower of London housed Crown Jewels, a treasure chest of 140 objects including Coronation orbs, swords, sceptres, coronets, robes, and the Royal Crown made up of 2,868 diamonds, 17 sapphires, 11 emeralds, 269 pearls, and 4 rubies. Showing here are some world famous artists’ works from Annie Leibovitz, Andy Warhol, Cecil Beaton, Mario Testino, Sir Joshua Reynolds, Van Dyck, and Holbein. Most of the large scale portraits are lush and extravagant, a sea of luxurious fabrics, jewels, furnishings, headwear, ribbons, brocades, and postures. Displays of power and wealth, these are dizzying depictions, many taking up large real estate on the walls. Handsome young men remind us that Justin Bieber celebrity is no new thing. 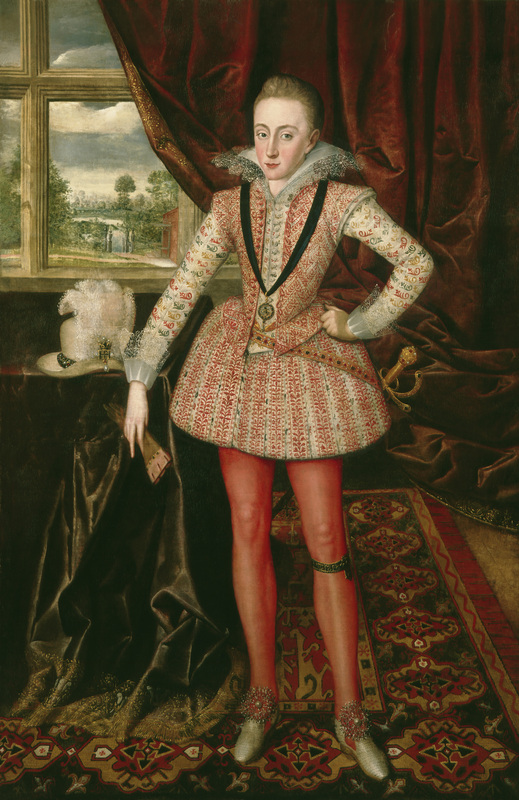 1610’s Henry, Prince of Wales, reclining in gartered red hosiery, sadly deceased at 18, is a foppish handsome teen, and the 1616 painting of George Villiers, First Duke of Buckingham, James I’s favourite and likely lover, stands almost 7 feet tall, tottering on high heel slippers encrusted with feathers and diamonds.The performance of identity and position is on show in every portrait. With friendly staff, a bookshop-themed-British, cloakroom, twice daily guided tours, and info officers in every room, you will find this a comfortable and informative educational experience, far simpler than the 24 hour plus flight to England. Child-friendly Corgi Notes for Kids give history in bite-sized pieces. The royals even made their own visits to this city of gold – Prince Alfred in 1867, Elizabeth and Phillip in 1954, and Charles and Diana in 1983, documented at the nearby Post Office Gallery. This exhibit has moments of intimacy. Delicate and personal items such as a 1762 silk baby robe for George IV, the 1550 steel armour for longed for boy king Edward VII, dead at 15; audio narrations of love letters from Henry VIII to Anne Boleyn, and at her execution. Paintings of famous mistresses, some from the streets, like Nell Gywn, or a female ancestor of Camilla Parker- Bowles, King Edward VII’s mistress. The flambuoyant tartan evening suit of the Duke of Windsor, Edward VIII, who famously abdicated to marry the American divorcee he loved, dances on its frame, and we witness Queen Victoria’s lifetime mourning dress for her beloved Alfred, all highlighting a more private side of life to what were and are real human beings. 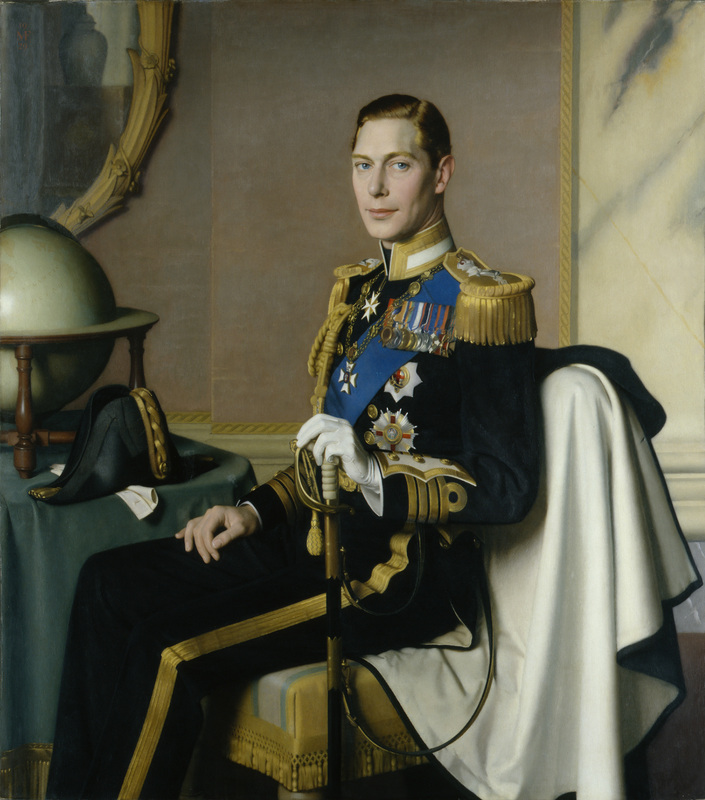 King George VI By Meredith Frampton, 1929. Bendigo is just two hours up the Calder Highway by car or by VLine train, and choc full of artistic, culinary and historical sites. 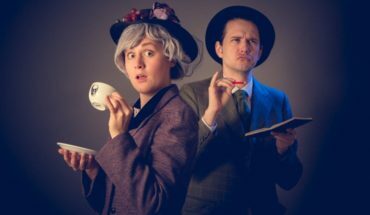 Many events partner with this coup of an exhibition, including Wedgwood high teas, curatorial talks, a jewellery workshop, and The Victorian Goldfields Railway’s The Royal Train running select dates to Castlemaine. 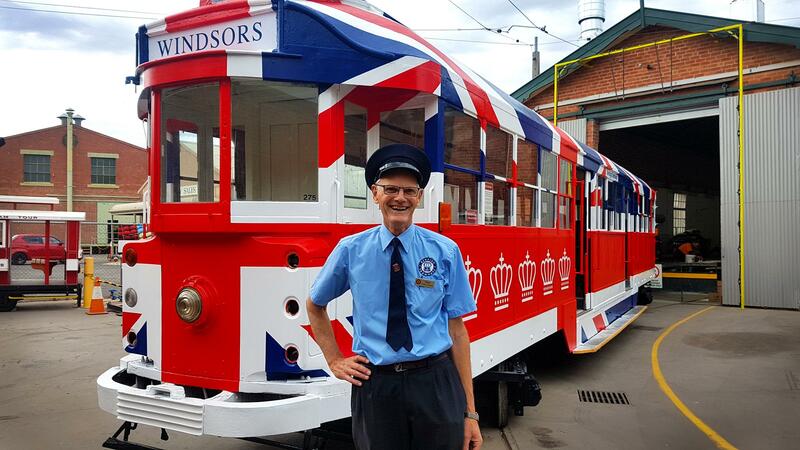 Bendigo Tramways, housing the country’s sole working workshop for heritage trams, has one emblazoned with the British flag, at the Piazza by the gallery, overlooking the recently restored, gorgeous Victorian Alexandra Fountain, sitting central to busy city traffic. Beside a red British telephone booth, the Royal Pop Up Tram Cafe is a must see. The jump on and off Royal Express tram rides daily through the city, with performances of An Evening With The Dame at night, and local Chancery Lane has royalty-themed paste ups. You can also live a fairytale fantasy with a Cobb. And Co. Royal Horse-Drawn Carriage ride. Don’t miss local Michael Piggott’s 9 months-in-the-making Lego scale model of the Palace of Westminster at the Bendigo Visitor Centre, where there are also lifesize cut-outs of Will and Kate, HRH Elizabeth II, and Harry and Megs for more royal selfies. As we await the imminent birth of the latest Prince Hal’s bouncing babe, get into the spirit of the rollicking royals in inimitable style. Bendigo Art Gallery has brought a stunner to town you won’t want to miss. 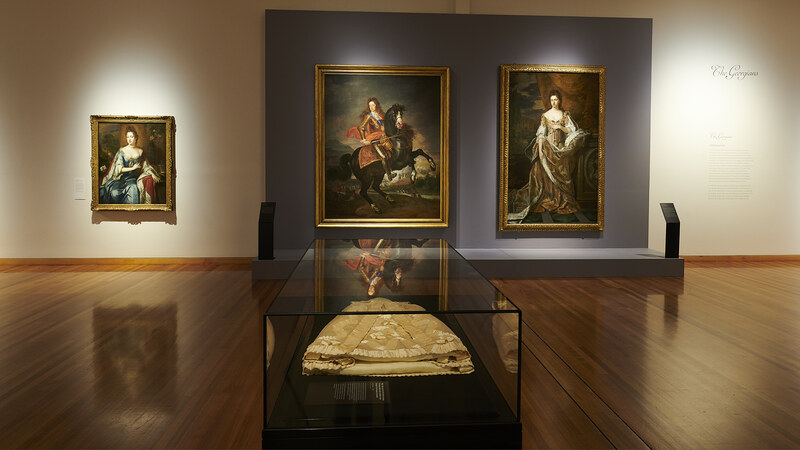 Tudors To Windsors: British Royal Portraits shows 16 March – 14 July at Bendigo Art Gallery. Book tickets here. Auslan Tour 27 April. The venue is accessible. 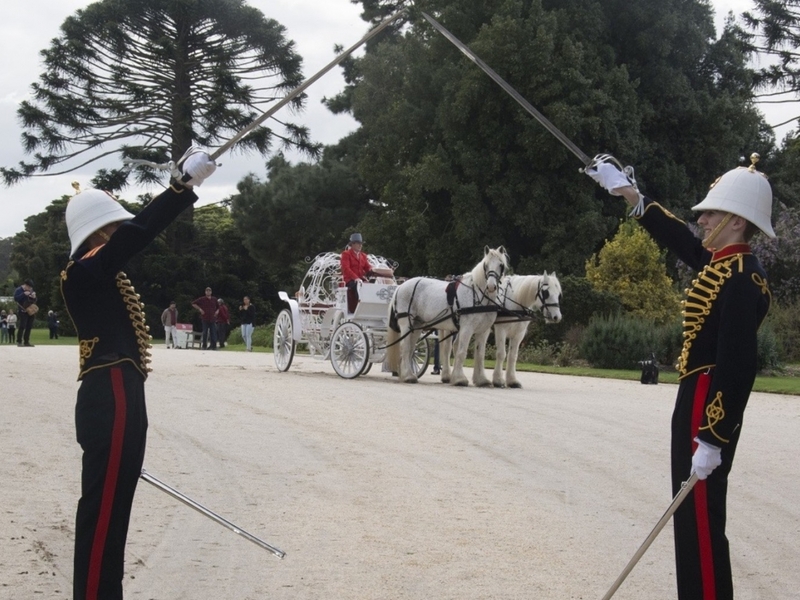 Check out Bendigo Tourism’s royalty-themed packages, and extras in the Gallery’s program. Disclosure: The Plus Ones were guests of Bendigo Art Gallery.